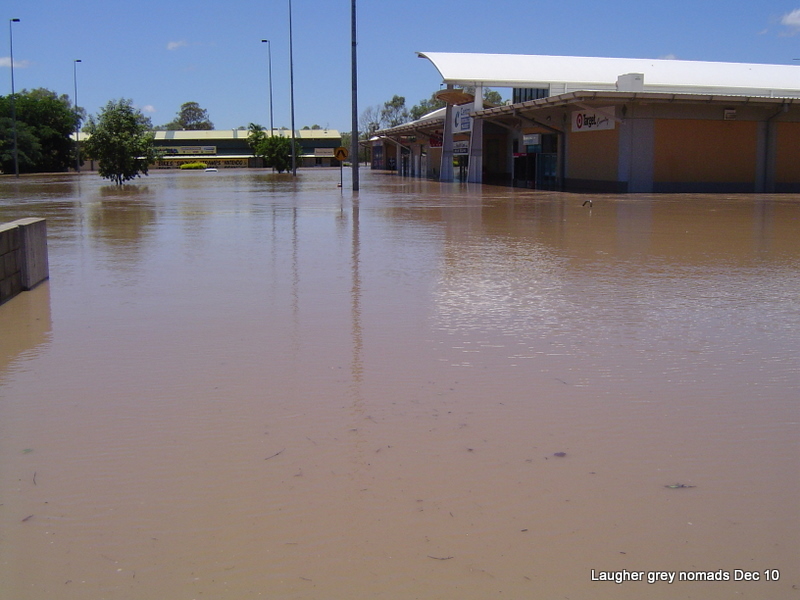 Not sure what Queensland has done to deserve the wet wet wet weather we have experience so far this wet season. 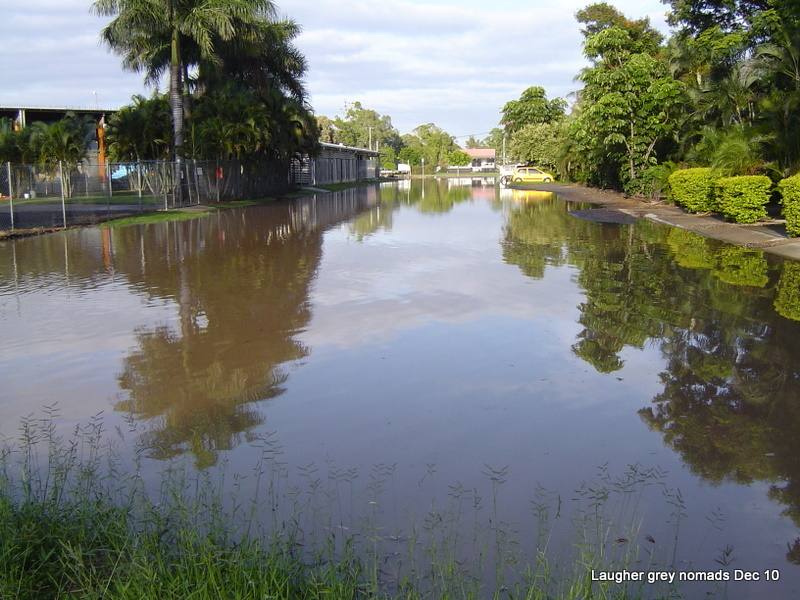 Emerald’s flood at the end of 2010 is now but a distant memory, far surpassed by the Toowomba flood on David’s birthday then the consequent Brisbane floods and topped last week by cyclone Yasi. With over 20 inches of rain in the catchment of Fairburn Dam over Christmas we had about 5 days warning that a flood was coming. 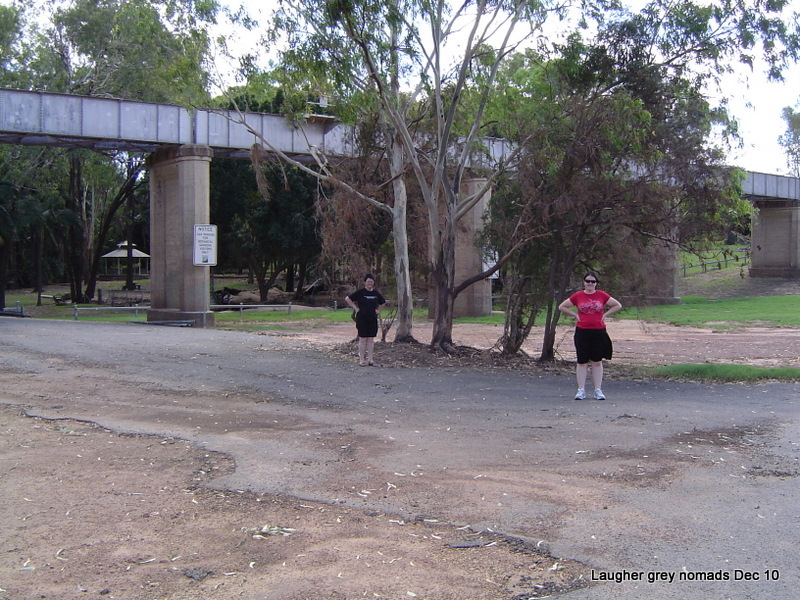 Fairburn Dam is just south of Emerald, on the Nogoa River which run through town on the other side of the golf course right next to our caravan park. We lifted as much as we could off the floor at work on the Tuesday morning and then were sent home to fend for ourselves. 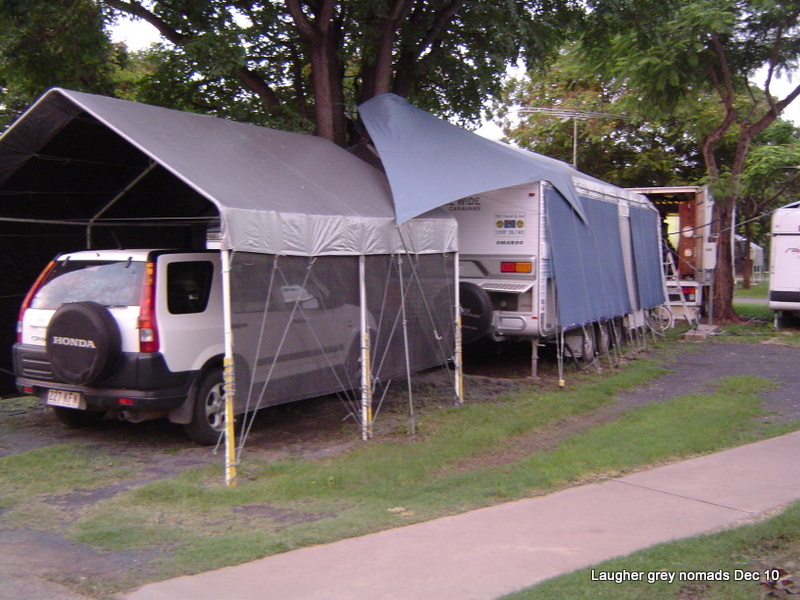 First thing I did was to take the motorbike to a mates place near the airport – it’s something like 30ft higher than the van park. I got 40 litres of fuel for our generator and checked all our gas bottles were full. I filled our water tanks so we had 1200 litres of drinking water. The only thing we were short of turned out to be xxxx. 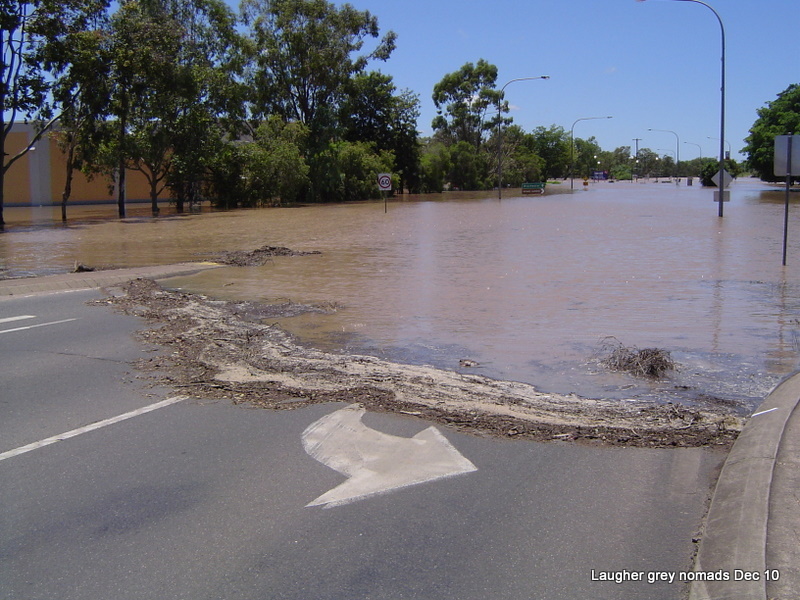 Most of the long-term locals based their plans on the January 2008 flood. Council released a map showing the areas of town that would be affected. 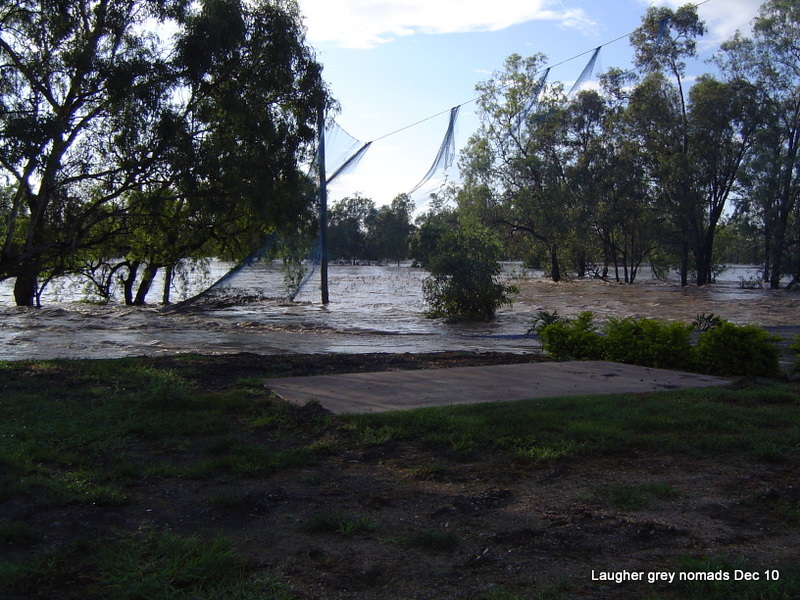 That map included our caravan park but the long term tenants near our site soon pointed out where the water came to in 2008 – still approx 900mm lower than ground-level in our area of the park. After a bit of soul searching we decided we would stay put. We lifted the outside fridge and cupboard off the ground and packed everything else into the truck. And then the agonizing wait for the water to peak began. Early the next morning Council added some 800mm to the expected peak which put a bit of fear into us. By then it was too late to pack everything up and move the caravan to higher ground even if we wanted to as all routes out of Emerald were cut by flood water. 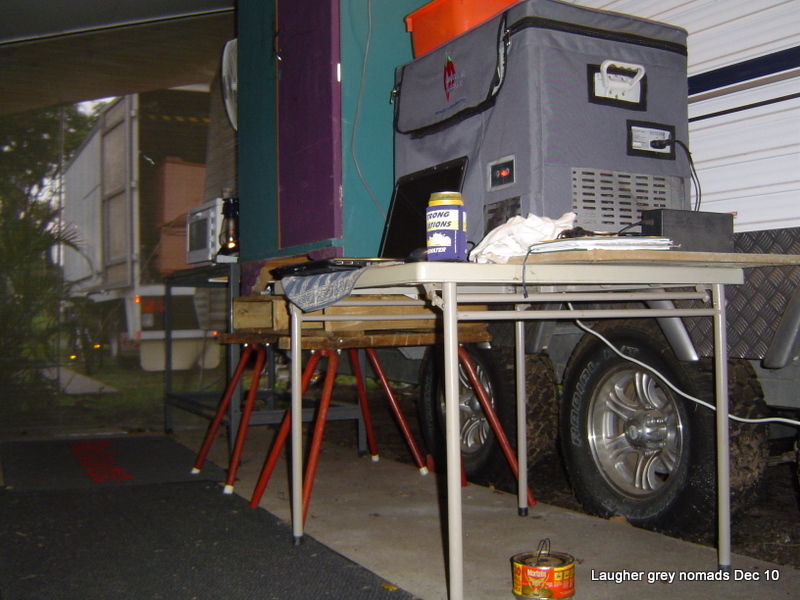 For us the damage would start if the floor of the caravan went under water. The floor is 750mm off the ground. 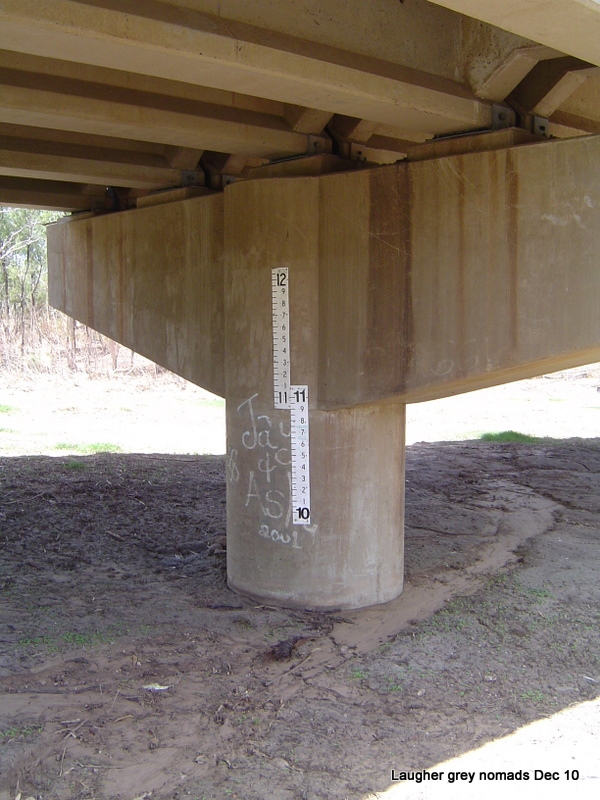 The floor of the truck is 1100mm off the ground. Thursday was spent waiting and watching. By midday the access road out of the park was flooded and then the road across the front of the park started to fill with water. Impromptu “flood parties” began. 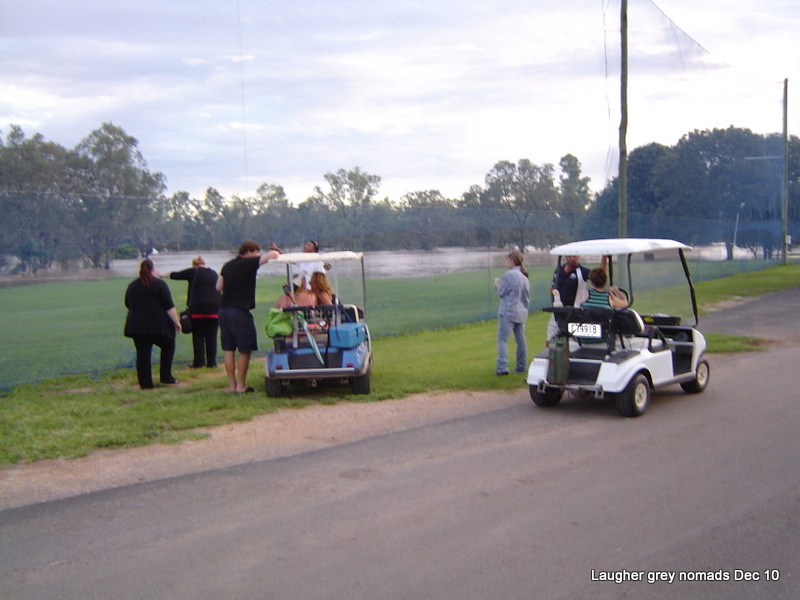 One party were watching the water advance through the golf course. Another group gathered to watch car attempting to get through the water on the road outside the park until Council came along and barricaded it off. At around 7pm the Council worker manning the road block told us he had just been told that the peak of another 200mm would occur around midnight. I did a quick walk to the other side of the park and could see that we would be safe. With a sense of relief we both managed to get a bit drunk that night. Basically, we had our New Years eve celebration one night early. New Years eve dawned with the flood at its peak. Emerald was divided into about 6 islands, with no means of normal access between the islands until the water went down. Helicopters constantly flew overhead from dawn. I managed to hitch a boat ride to the main part of town to take a few photos and replenish the carbohydrate (xxxx cans) supply. Work had 1 meter of water through it. My work depot is on the western side of Emerald. I managed to drive through to there just before noon on the Sunday to find our 2 buildings had been inundated with 1000mm of dirty stinking oily water. When I first got there water was still in the street and over the gutter. After contacting the boss we started the clean up. We lost a lot of clothing, all office fittings, computers, desks, etc. All our vehicles had problems but I was lucky to get our mechanic to go over them all on the Monday even though his premises had been flooded also. Two trucks and a van were written off. My usual drive (a Hino 916 pantech) had water in the diff and water in the main fuse box. The other truck had a wet air filter but luckily no water in the cylinders. To our clients surprise we did a run out to all mines on Tuesday, just after the road to the north was reopened. We took 3 truck loads of water damaged clothes, office fittings, etc to the temporary pile the Council set up at the saleyards just around the corner from work. Depressingly, at its peak the pile grew to be bigger than a couple of big 2 storey homes side by side, even though a convoy of at least 10 B double and triple trucks were taking the rubbish away every day. 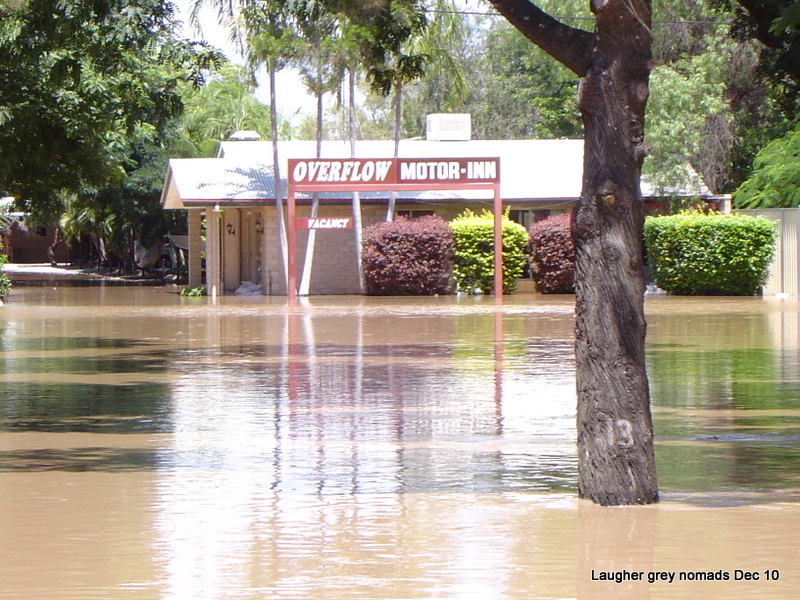 Something like 1050 homes were inundated and 95% of all businesses (ie 300+) were affected. Our site - packing up is not a small job! The motorbike usually sits on the left of the Honda but is now sitting on a mates front veranda at least 5 meters higher than here. David’s birthday was a low key affair as everybody was still cleaning up after the flood. He did manage to have a few (or more) celebratory xxxx cans though. Brianna flew in for a visit the week after David’s birthday. We all had a great few days together before she flew back to Brisbane for a week long computer programmers conference. 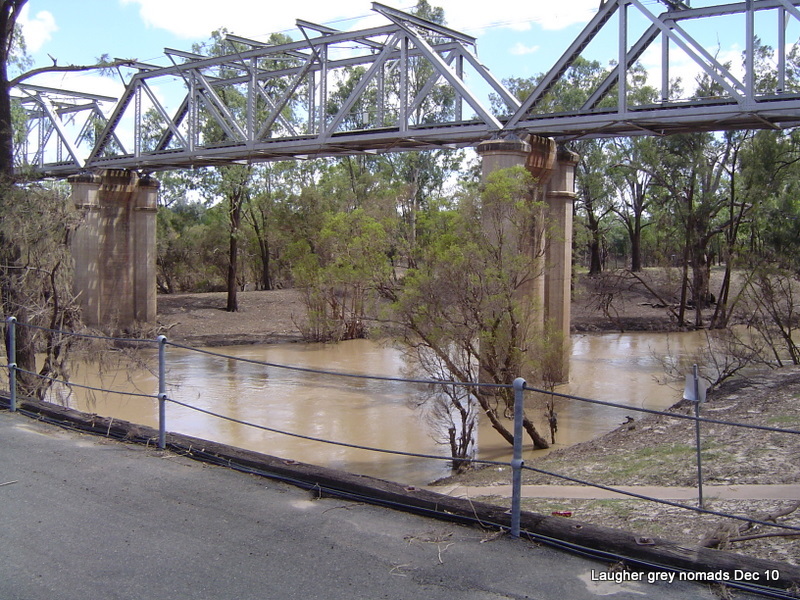 Main road bridge towards Rocky - it had 2m of water over it at the flood peak. Capricorn Hwy at Opal St, looking east towards Rocky - road bridge is 1.5m underwater, Coles on left has 1m of water thru it. Mother and daughter trying to make a stand - "Stop stuffing around Dad, it's time to get to the airport"
A cruel twist to finish this ‘Flood’ story. 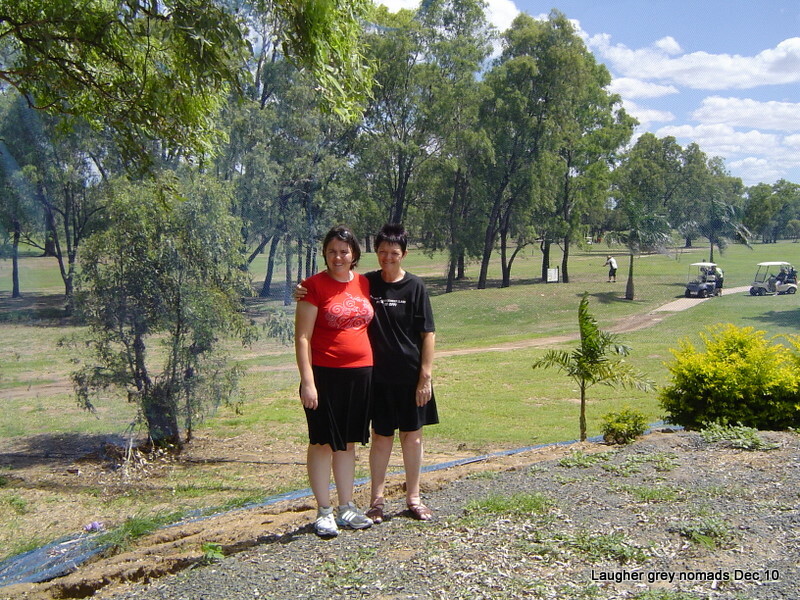 After Brianna finished her conference in Brisbane she flew back to Melbourne and shifted house, from Richmond to Elwood. 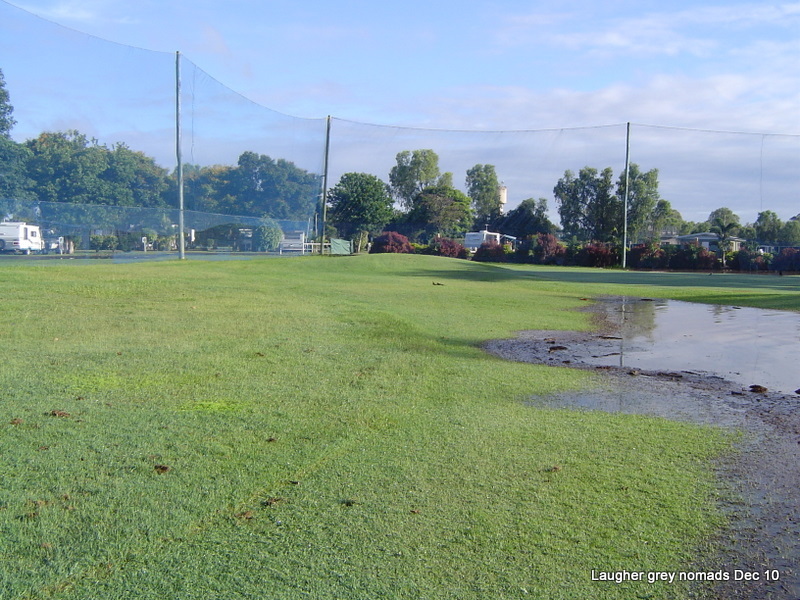 Last Friday Melbourne was hit by a summer storm with up to 200mm of rain dropped in some suburbs. 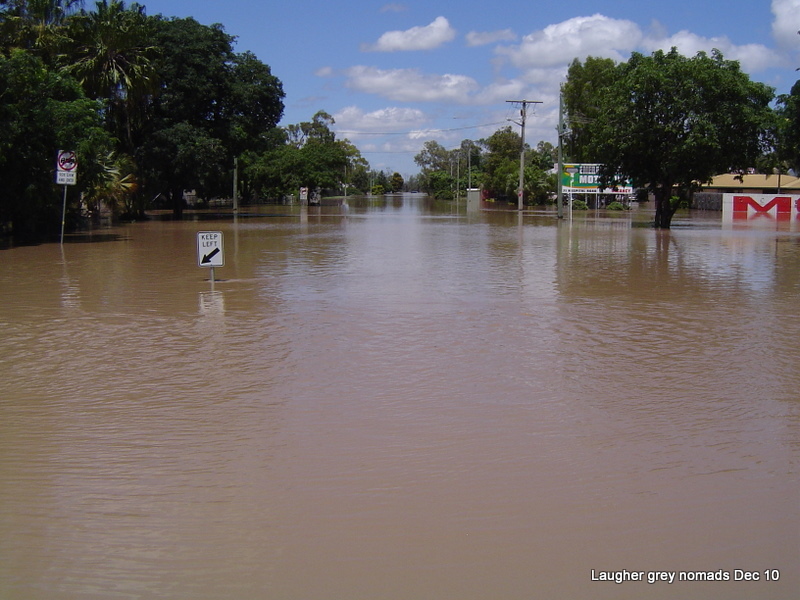 Brianna’s new house was flooded with water approx 300mm deep, as was the whole street. Thankfully family and friends have come to her rescue. 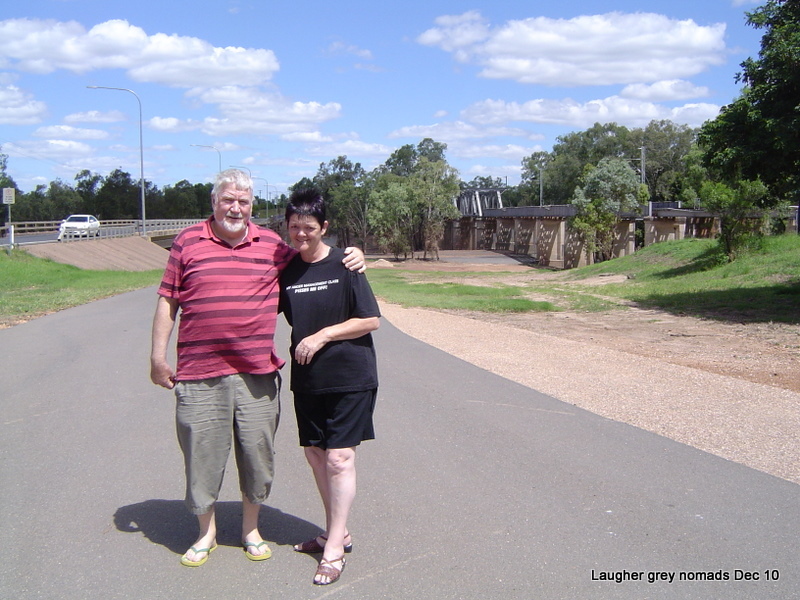 We have both felt for her – times like this drive home just how far it is from Emerald, Qld to Melbourne, Vic.